Salcombe, a harbour town,is situated on the South Devon coastline, within a designated Area of Natural Beauty, so you know you’re in for a treat. Five glorious safe, clean sandy beaches litter part of the coastline, rock pools teeming with sea life, sailing and pleasure craft offer opportunities to ‘get on the water’ whether on your own in a hired motor vessel or aboard the picturesque ferry. Other watersports are available, and if your a newcomer, tuition if offered. If its shopping or browsing you are looking for then there are a multitude of shops, galleries and museums, many delving into the boat and ship building history of the town, relics of the fruit spooners can still be seen, some as shipwrecks. Offering a mild climate the area boasts exotic plants and is teeming with bars and cafes to rest and enjoy the welcoming atmosphere, restaurants feature locally sourced delights, fantastic, especially after a walk taking in the spectacular views of the coastal path, the lucky ones may even spot wild dolphins or seals playing in the waves. Salcombe is sure to offer everyone something with so much variety. A true gem. As air and boat fares continue to steadily rise, so too do the number of Britons choosing to opt for a ‘Staycation’ – a holiday without having to leave Britain’s shores. To this end, an increasing number of excellent holiday cottages to rent are becoming available in many locations around the country; allowing holidaymakers the option of an even more cost-effective getaway, without compromising on quality. The flexibility, value for money and often unique nature of these UK cottages has meant that the rental market is currently thriving, and that many superb deals can be found. There are few places within the United Kingdom more popular for a such a holiday than the south west coast of England. Tens of thousands of tourists flock annually to Devon and Cornwall; taking advantage of the stunning coastlines, National Parks and wonderful beaches that the country’s easternmost counties have to offer. On one of Devon’s most southerly points, lies the beautiful seaside town of Salcombe – where a large number of exquisite cottages for rent can be found. Located in an almost perfect location for a holidaymaker, the town (which is part of the South Devon Area of Outstanding Natural Beauty) features some amazing scenery, walks and beaches – as well as a wide and varied array of things to see and do within easy travelling distance of your holiday cottage. In Salcombe itself, tourists can find plenty of entertainment . Many of the most popular pastimes here are found on or in the water, and the town has a thriving yachting and boating industry – with an incredibly popular water sports centre being the first port of call for the majority of water-lovers. Sea-N-Shore Ltd offers the opportunity to water ski, powerboat, and rib ride all with highly qualified instructors (with varying difficulty levels of each, based on age and ability). For something slightly less adrenalin-fuelled, they also offer cruises around the Salcombe coast – as well as seal watching trips and sea safari tours. If you are brave enough to ‘go it alone’, Sea-N-Shore also offer the opportunity to hire your own boat and explore the local waterways as you see fit. A word of warning, however, many of the above activities are extremely popular (especially in the peak summer months) and it is often advisable to book ahead. In a similar vein (but allowing holidaymakers to stay on dry land), Regatta week is held annually in the month of August. If you are lucky enough to be visiting at this time, the town is a sight to behold – and packed with things for the entire family to do. Besides the obvious sailing and rowing competitions, there are air shows courtesy of the Red Arrows and Chinooks, parachuting, pavement art, quality live music and food stalls – selling both traditional food, and seafood caught locally. For the younger traveller, there is face painting, crab catching (for those brave enough to give it a go!) and sandcastle competitions. Overall, there is a truly delightful all-day carnival atmosphere that the entire holiday group is certain to enjoy. Despite the fact that there is a very strong relationship with the sea, not everything to do in and around Salcombe is nautical-related. In fact, some of the most stunning walks in the UK can be found in the immediate surrounding area; perfect for both experienced hiking enthusiasts and those who simply enjoy a nice stroll. Perhaps the most impressive of these is the Salcombe to Bolt Head Walk, one of a series of trails that make up the South West Coast Path. This particular three mile stretch takes walkers through some dramatic rocky peaks and wondrous cliff edges, culminating in some outstanding views from Bolt Head – a former Second World War lookout. It is an absolute must to bring your camera, as there are picture-perfect views that you will wish to relive time and time again. Of course, any holiday – at home or abroad – is not strictly confined to the immediate town in which one is staying. For many, part of the appeal of a staycation is that they are able to bring their own vehicle on holiday; allowing them the ability to explore their surroundings. Having your own transport is a massive boon when in Salcombe due to the volume of things to do just a short drive away. The world renowned Dartmoor National Park is only slightly over half an hour’s drive away, which features yet more beautiful scenery and spectacular walking trails. As well as this, the park has some excellent attractions – including an archery range (featuring coaching and target practice) and a butterfly farm, where visitors can view and learn about some exotic and tropical butterflies – truly a unique experience. For those happy to travel a little further away from your rental property, Exeter is just over an hour’s drive north of Salcombe. 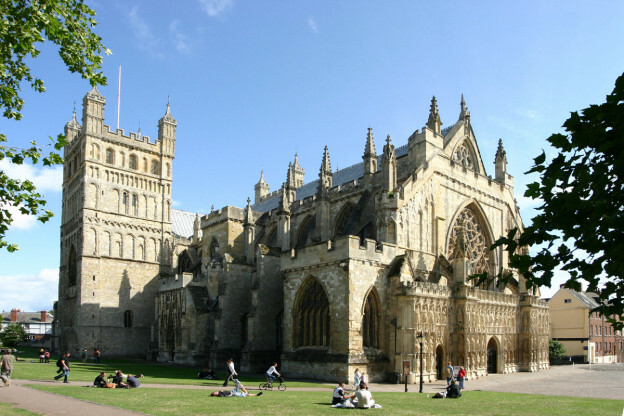 This historic city is perfect for a day’s cultural sightseeing – Exeter cathedral is a spectacularly ornate place to start your tour, with almost a thousand years worth of history within its walls. The Royal Albert Memorial Museum is a world-class ode to Devon’s rich and varied past; the museum itself is free to enter, but relies on donations from those who do. In the evening, particularly for those travelling outside the summer months, Exeter racecourse provides gambling, thrills and spills in a picturesque setting – as well as wonderful hospitality packages. Just under an hour’s drive to the west is the coastal city of Plymouth, which provides a different sort of entertainment to Exeter, and is the home of the UK’s largest aquarium – the National Marine Aquarium. Families can make use of concessionary rates, and the experience is a fascinating one; culminating in an unmissable interactive dive show at 2pm daily. Plymouth also features the Theatre Royal, which boasts that it is “the largest and best attended regional producing theatre in the UK”. With some phenomenal touring shows, as well as plenty of local productions, there is certain to be something on stage to suit almost every taste. Dining is an integral part of any holiday, and it is here that Salcombe excels itself. One of the major benefits of staying in self catering accommodation is the ability to keep your holiday costs low by cooking for yourself, and being so close to the sea is ideal for fresh produce. The Salcombe Boat Hire & Fishmongers is located just metres from the Estuary and features both prepared and raw catch for any culinary enthusiasts. If red meat or poultry is more to your tastes, P W Coleman butchers has an inspiring range of both, allowing a wide range of dishes to be created in your rental property kitchen. Despite the obvious financial benefits of cooking in your cottage, there are plenty of excellent eateries in and around Salcombe in which to treat yourself. As a town which prides itself on a thriving fishing industry – of which crab fishing is a particularly important part – perhaps The Crab Shed is the most appropriate restaurant for an out-of-towner. With all fish provided by either local boats or their own factory, reasonable prices and a beautiful waterside setting; The Crab Shed is a seafood aficionado’s paradise. For those who fancy a change from the – albeit fantastic – seafood, the No 55 restaurant is the perfect solution. While there are still plenty of fish dishes available, there is also a huge array of freshly cooked fare from all of the major food groups on their menu. With regular cocktail promotions and midweek special offers, this family-owned delight is not to be missed. As an all-round holiday, renting a holiday cottage in Salcombe is an almost perfect getaway. Negating the need for passports, airplanes and learning a new language, this south coast delight is becoming more and more popular. With plenty to see and do for children and grown ups alike, this staycation can be as action-packed or as quiet and restful as you wish to make it. While a car is a definite benefit, it is not essential; as there are excellent bus services to and from Totnes and Plymouth railway stations. The town itself is easily walkable, with a strong local bus service for those who require it. Although many cottages are available all year round, for those wishing to book Salcombe in the summer months, it is better to do so sooner rather than later; as accommodation is going fast in this little gem!